The world's first edible insect farms have gone into production after a successful Kickstarter campaign by Katharina Unger and her company Livin Farms. 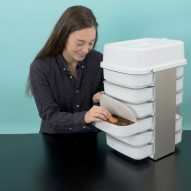 The compact desktop device – called Hive – allows owners to cultivate and harvest mealworms in their kitchens for use in a variety of recipes, including mealworm cookies, dumplings and risotto. Speaking at Made In Space, a three-day festival held at Space10 in Copenhagen's meatpacking district, Unger told the crowd, "We want to get insects to a point where they are not something strange but actually part of our everyday life and our everyday diet." "Insects combine the best of meat- and plant-based proteins while taking only a quarter of the feed and 10 per cent of the land that is usually required to grow the same amount of beef." Following two years of development by Livin Farms, including 2016's Kickstarter campaign, the first 300 farms will be delivered to customers later this year. 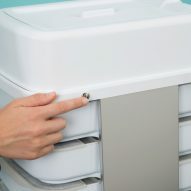 The design takes the form of a set of six climate-controlled drawers with a ventilation system to help stop smells from escaping. Owners begin by placing a starter pack of mealworms in a pupation compartment in the top drawer. Fed on oats and vegetable scraps, the mealworms mature into adult beetles in a few days before they begin mating and producing larvae. Each week, the mealworms are lowered until they reach the sixth drawer, when a green light signals that the biweekly harvest can begin. 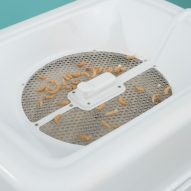 The tray of mature worms is then poured into the device's harvest area, where any pupae and waste is filtered out to continue their lifecycle in the device. The remaining mature mealworms are placed onto a heated plate, which stimulates the fresh, active and healthy mealworms to crawl off and fall down into a harvest tray. The fresh mealworms are then harvested and frozen. 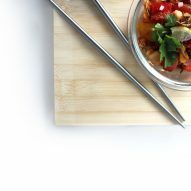 Unger says that the mealworms can be boiled, heated or ground up and mixed into recipes "like any other type of meat". The whole unit should be full within approximately eight-to-nine weeks, and owners can grow up to three meals per week. "Insects have a key position in the ecosystem to take waste materials and turn it into proteins and nutrients," explained Unger. "They combine the protein content of beef, the amino acid profile of tofu, while using up much less feed and much less land." "For example, insects have benefits over plant-based proteins as they takes much less work to produce, much less space and can be fed on organic waste products," she continued. "Another point is that insects are already being eaten in parts of the world." 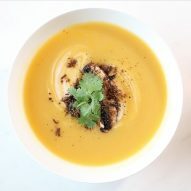 Livin Farms, which is based in Hong Kong, currently has about 1000 customers, but believes its product will help to grow the market. "If you're creating a new food, you need to create a culture, so this is really the first step," said Unger. "Potatoes, sushi and lobster were all foods that we considered strange at a certain moment in time." "Potatoes were a food for the poor, sushi was a workers food, lobster was the cockroach of the ocean. They all needed ad campaigns to change people’s perceptions." 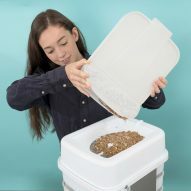 Unger, who co-founded Livin Farms with Julia Kaisinger, began investigating insect farming while studying Industrial Design at the University of Applied Arts Vienna after learning that the world grows more crops for the production of animal feed than it does for feeding humans. The first prototype was called Farm 432 – a similar tabletop system that would allow users to breed black soldier fly larvae. The Made In Space conference ran from 15 to 17 June, and explored alternative futures through a series of talks, workshops and seminars.